Thirty-year-old Chipo Dhliwayo was sleeping in her hut when the devastating Cyclone Idai landfall rolled huge boulders over whole villages in Zimbabwe's Chimanimani district in Manicaland province last week. Her husband had already rushed to rescue his parents who stayed a short distance from his homestead after rain started flooding houses. 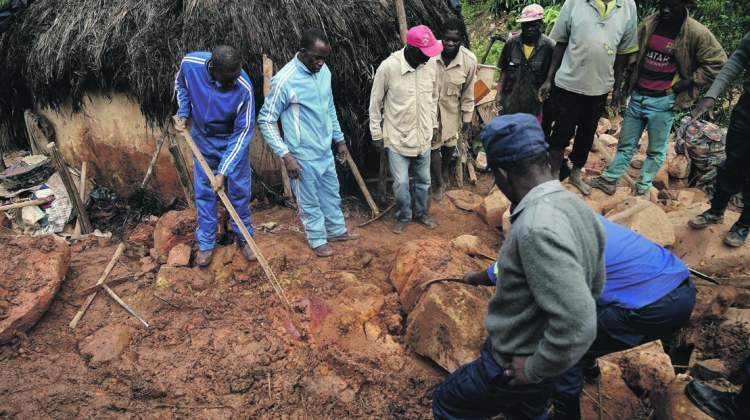 Several other villagers were simply buried under massive landslides, community members say. When Dhliwayo's husband returned to his homestead, huge boulders had already levelled one of his huts. Dhliwayo was wailing and yelling for help; her agony and despair heightened because her three children were still in the hut that had been brought down by boulders and stones. "Rocks came from the mountain and crushed our hut; my in-laws' house was the first to be destroyed. When our hut fell, my husband had gone to help my in-laws," said Dhliwayo, as Zimbabwe military helicopters with aid and relief arrived at the worst affected areas of Chimanimani days after the tragedy. "I had three children that were sleeping in the house and I managed to rescue only my six-month-old child on my own before my husband arrived back. "When he got back, I was crying and trying to move some of the rocks covering our hut to rescue our four-year-old kid, who survived. But the other child did not come out alive; he died in the hut, trapped under large stones," she said. The area had been unreachable for three days, with roads and bridges destroyed. Even military helicopters could not reach the area because of worse weather conditions. Dark clouds, heavy rains and mist characterised the aftermath of Cyclone Idai's landfall. Dhliwayo's plight was echoed by other villagers and survivors who woke up to find their neighbours' houses covered by mud and rocks. So far, according to the government, 189 people have lost their lives, but the body count is not over and villagers fear that the final tally will probably double. After visiting affected areas, President Emmerson Mnangagwa said on Thursday that "the human toll is likely to reach several hundreds". He said: "The horrific tragedy is likely to stay on in our memories for years to come." Opposition leader Nelson Chamisa also visited the area and criticised Mnangagwa for not responding more swiftly to the tragedy. Zimbabweans had joined hands to provide humanitarian assistance through donations, as well as volunteering to assist. Philip Goodwin, of the group Voluntary Service Overseas, said: "The need for emergency aid in Mozambique and Zimbabwe remains acute because rising flood waters are predicted in the next few days and many people are still at risk." He said "schools, hospitals and other facilities have been seriously damaged" or destroyed. Two days of mourning – ending today – were declared in Zimbabwe but villagers and communities in the worst-affected area of Chimanimani say the 189 confirmed deaths are just the beginning of what they expect to be a horrendous next few weeks. For starters, the number of those missing is still about 200 and some areas were still unreachable this week, making it impossible to determine the full extent of the disaster. At Dzingire Primary School in Chimanimani, 39 pupils and four staff members, including the headmaster, were still missing by Thursday. Two schoolchildren from St Charles Lwanga Secondary School were confirmed dead this week. Any survivors in remote parts of Chimanimani could die from hunger because humanitarian assistance took time to reach some areas. Mobile company Econet joined the rescue mission and was providing drones to help search for bodies and survivors in the mountainous area. Chimanimani was the worst-hit area, followed by Chipinge, also in Manicaland province, which hosts the plush tourist resort area known as the Eastern Highlands, as well as the Masvingo areas of Zaka and Bikita. A villager, sobbing and gasping for air, said: "I don't know where my two children are right now; we have searched everywhere. All I want is to know if they are dead or they are fighting for life somewhere. As a community we are expecting worse news because there are still a lot of missing people and we don't know where the bodies are if they died." According to the UN Office for Coordination of Humanitarian Affairs, the Tongagora refugee camp – which houses more than 12 000 people displaced or seeking asylum after fleeing countries such as the Democratic Republic of Congo and Mozambique – had been flooded. About 1 100 shelters for 3 209 households from the camp were "completely or partially destroyed". In the Chimanimani and Chipinge districts at least half of the total population had been affected by the cyclone, according to preliminary findings of an intersector assessment mission which confirmed significant damage, as did the UN Office for the Coordination of Humanitarian Affairs. The districts of Buhera, Bikita, Chikomba, Gutu, Mutasa and Mutare had sustained damage and many people had reportedly been displaced, with "at least 16 000 households having been affected".